PRODUCT: #LA25-375 Adjustable Lead Pipe Flashing, 3-3/4 inch ID x 12 in. Riser fits 3 Inch Pipe, 16 X 16 inch Base, 2.5 Lb. Lead. Lifetime Manufacturers Warranty. Price/Each. The 2-1/2 lb /sq.ft. high purity lead material assures a long life (also available in 4 lb version). The all-lead seamless riser flashing provides a watertight seal and completely protects the penetration. Lead flashings have superior characteristics such as malleability, corrosion resistance, malleability, expansion and contraction and are suitable for all climates. Adjustable flashings will work on all roof pitches up to 4/12. Special flashings can be ordered for greater angles and with higher risers. 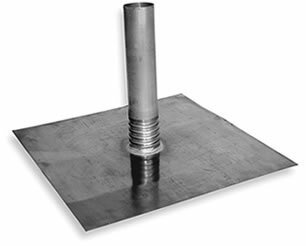 Optional base sizes are 12x12", 12x18", 18x18".